Why aren’t wages rising like they used to, when they were the source of the American Dream for millions? Well, because the natural power balance/equilibrium between labor and management has been artificially distorted by gov’t to favor owners over workers. Owners of the means of production (a Marxist phrase, but one can use it w/out advocating communism) / the banks / the lenders / the stock owning class (20% of Americans) / the capital controllers / big business owners are artificially gaining an advantage to keep the wealth of America swirling around the top rather than torrenting down, like it would in a truly free market. The economic rules, with the aid of gov’t, have rigged it in favor of the upper class against the middle & working classes. By the natural equilibrium / balance of power between labor & management being tilted toward owners and away from laborers. We’ve a class of debtors now in America living paycheck to paycheck. 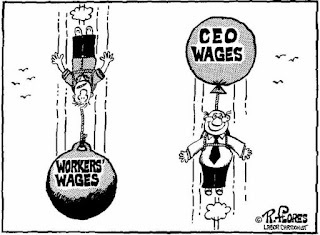 Economic distortions favoring the well-to-do stagnate wages. This is a classic example of the market not working because of gov’t meddling in the economy, and its slamming the poor & middle classes. How is this done, you ask? The Fed’s holding down interest rates and bailouts subsidize the investment class at the expense of workers. The Federal Reserve Bank artificially holds down interest rates which favors banks. Bailouts privatize profits, but socialize losses--meaning taxpayers pay bankers. Same for FDIC subsidized bank insurance. Subsidized insurance subsidizes risk. 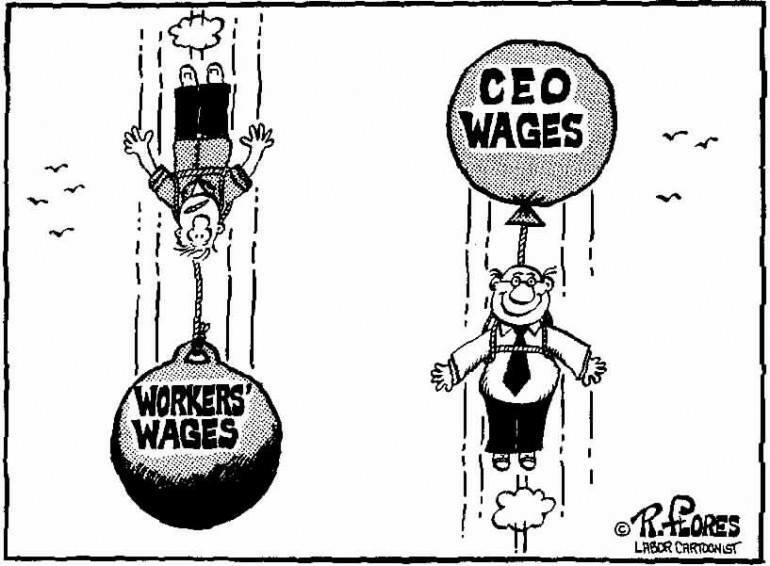 Bankers & owners benefit, while workers suffer. But liberals and unions have missed this point, instead wrong-headedly focusing on the minimum wage--which hurts the very people its designed to help. Focusing on ending the Fed and its ugly sister, crony capitalism, would do far more for workers than any gov’t intervention in the economy. Economics 101 should teach us all that. A free market wouldn’t tilt like this in favor of elites, and wages, correspondingly would rise like they naturally should in a free enterprise society.